Dylan Matthews of Vox writes that Peggy Olson’s story lines in Mad Men were always about work and queries why her ending was about romance. His generalization about the arc of the Peggy storyline was disputed by commenters. Liz Kuehn Hager countered that “The basis of Peggy’s storyline was always the struggle balancing work and home/romance,” which was echoed by many subsequent commenters. 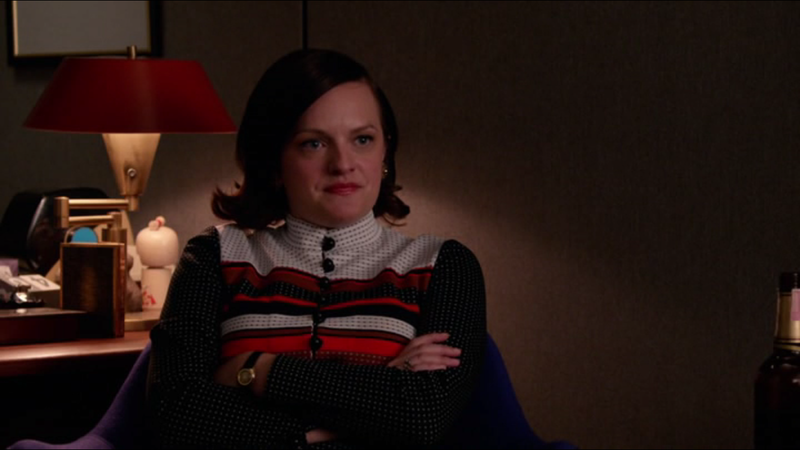 It all made me think, what was the Peggy Olson storyline? How did it end? What were the writers trying to say? Peggy and Don are mirrors of each other, both ambitious self made creatives in corporate America coming into their own, searching for the big creative idea that will change the world. Peggy gives up her baby to follow her dream. Don takes another man’s name. Saying that Peggy’s storyline ended with romance ignores all but one of the key scenes tying up Peggy’s story. Let’s go through them. 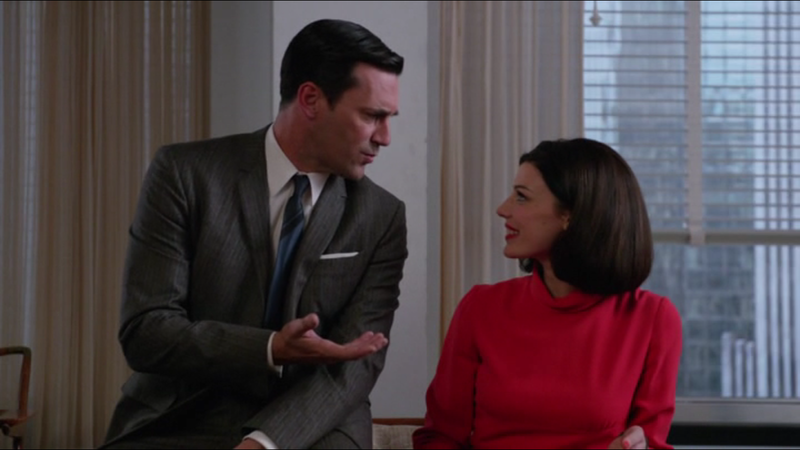 Peggy has a singular drunken afternoon with Roger Sterling in which they grieve the demise of Sterling Cooper and he mentors her, finally. 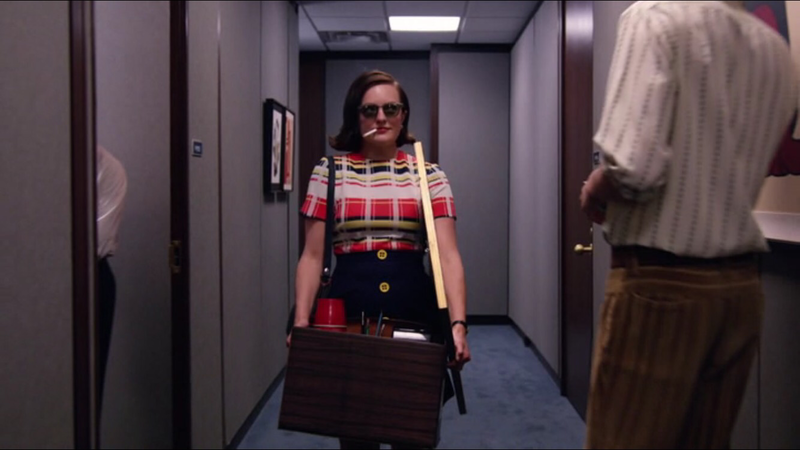 Roger tells Peggy she should not try to put men at ease and gives her Cooper’s painting of an octopus pleasuring a lady, which leads the following day to her iconic entrance into McCann carrying the painting, chicly smoking a cigarette, sporting black sunglasses, owning her hangover and hard drinking style. Owning, finally, her own version of cool. 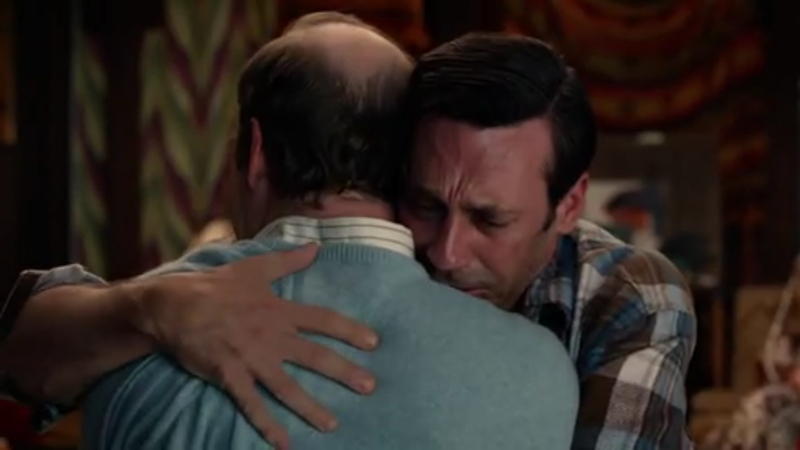 Peggy has a tenderly professional goodbye with Pete Campbell, her peer, in which Pete predicts she’ll be a creative director by 1980 and that someday people will brag that they worked with her. She proves her mettle in her first copyright meeting at McCann eating the dour Dolores alive over an account right after a couple of other copyrighters, made of lesser stuff, slink away without their kill. She is offered partnership by Joan which she turns down in favor of sticking to her chosen path of creative director. She pulls Don back from the brink – “I took another’s man name and made nothing of it.” – like only she can, in a dramatic scene of the hushed and sacred promise of working on Coca-Cola. Here are all the big characters in her life – Sterling, Joan, Pete and Don, tipping their hats to her, so to speak, of how far she has come and how far she will go. Stan and Peggy also confess and realize, respectively, their love for each other. Because for her and Don, dare I say for anybody, there is no distinction, there is no border, between the two. Isn’t there something to be said for that? We love dichotomies, but why? Why does life have to be carved up like that between work and family or personal? Between work and life? When did that happen? 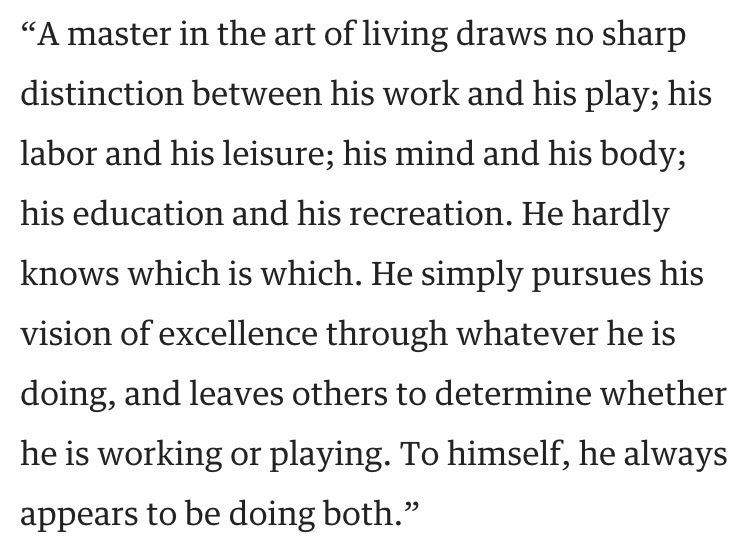 The idea that you cannot have it all assumes there is more than one life to live and that somehow you live one life at the expense of another, as though people who work are really leading two lives. 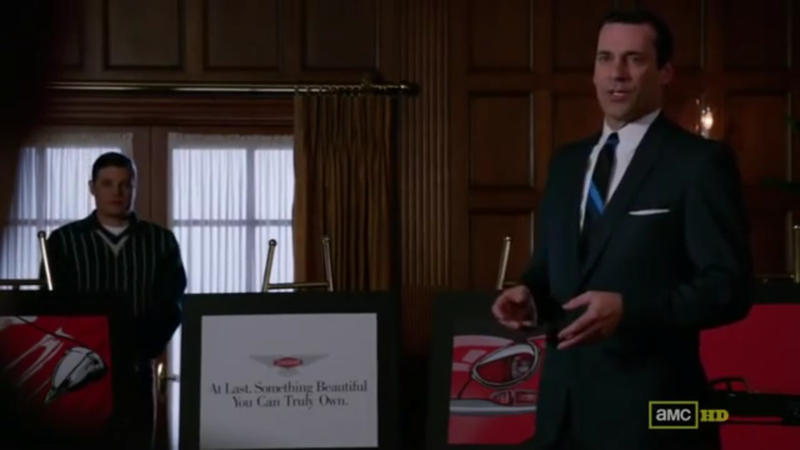 Don’s desperate drive across America, his fear at the VFW event, pretending to be a refrigerator salesman in Racine, ending up at the spiritual retreat in California with all to show for it the Coca-Cola ad shows us just how unnatural leading two lives is, literally and figuratively. Let us take a detour and juxtapose Don’s marriages with Peggy ending up with Stan. Don’s professional and personal life are very separate right from the first season in his marriage with Betty. Betty is isolated in the boring suburbs. They have little in common. Their marriage seems unnatural,disconnected, broken up. Enter Megan. At first, Don sees her as a good stepmom, a breath of fresh air after Betty’s constant struggle and tension with motherhood. Then, Meghan wants to be a copywriter and ends up being an effortlessly brilliant one. Megan comes up with the time lapse idea and slogan for Heinz, decidedly a big idea. Don is in awe of her. “I think she’s good at everything. I think she’s just one of those girls,” says Peggy to Joan about Megan in Season 5. Around this point, we see glimpses of perhaps a less tortured, a less segregated, a more organic existence for Don. His “personal” and “professional life” is unified and the tension of his previously segregated life lessens even vanishes for a few episodes. He has one life. Don and Megan pitch an idea to the creative team. 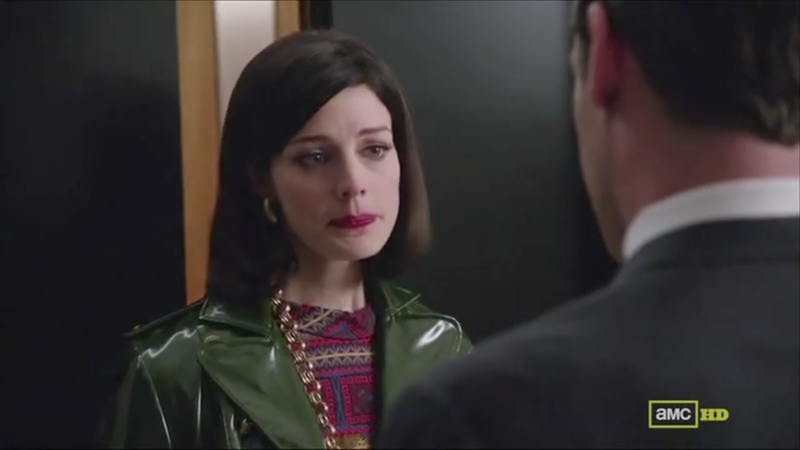 Megan soon decides to quit Sterling Cooper, however, to pursue her acting career and everything degenerates from there, for her, for him and for their marriage. 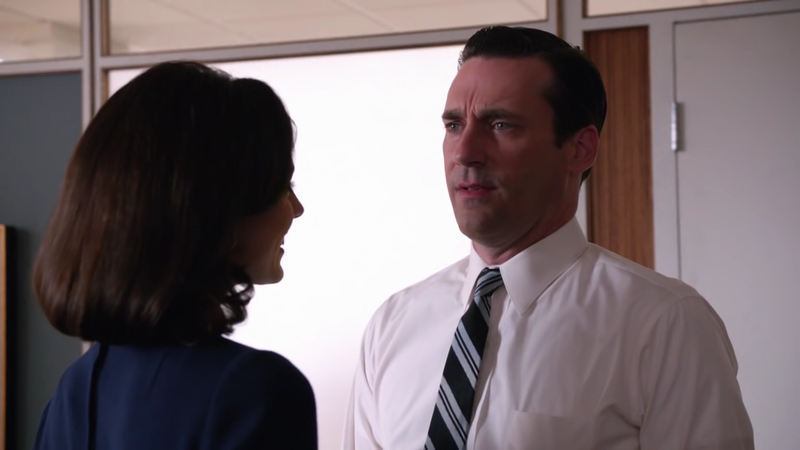 Megan knows Don well and knows that leaving Sterling Cooper is about more than just leaving Sterling Cooper. By the end of that season, Don fades back into his painfully duplicitous mode of relating in his “personal” life as he slides onto a bar stool next to a beautiful woman. Stan comes on the scene as art director in the Clio award episode in Season 4. Stan and Peggy have a rocky start that very slowly evolves into a constant friendship, an easy comfort and open dialogue. By season 7, Stan is in awe of Peggy, telling her not to partner with Joan just because she wants to be in charge, that she has “such a rare talent” that she doesn’t need to keep “looking over [her] shoulder at what other people are doing.” Stan’s “slackerism” according to Dylan Matthews is actually a perfect counterbalance to ambitious and driven Peggy. Most importantly, Peggy confesses to Stan that she gave up her child. In defense of Stan, when he tells her, “When I’m in front of you, I want to strangle you,” he does so in response to Peggy calling him a failure in the previous scene. The only love interests with whom Don was totally vulnerable and honest were with Rachel Menken and then the Rachel double – Diana the waitress. When Don’s double life starts to unwind at the end of season 1 he goes to Rachel and begs her to save him by running away together. That comes full circle in Season 7 when Rachel dies and he makes a last ditch effort to unify his lives by reversing roles and trying to save the waitress Diana, Rachel’s double whom he meets right after Rachel’s death. He hits another dead end in Racine after pretending to be someone he is not and then spirals out of control until his call to Peggy immediately followed by his group therapy where he comforts the inconsolable man. In Peggy’s last scene scene, she finishes some copy at home with Stan standing behind her supportively massaging her shoulders. Peggy’s ending is not about romance. Peggy’s ending is about moving away from dichotomizing our life between personal and professional, between work and life. Peggy’s ending tells us that maybe having it all is just about having one life instead of two because trying to lead two lives is unnatural, imbalanced, painful and actually impossible. Thanks, Millie! I love to analyze characters in other people’s stories!! Me, too. I like to write about them in my books! lol Whilst you’re about… I’m in the middle of doing another award post and was considering nominating you. Would you be OK with that, or prefer that I didn’t? It’s The Creative Blogger one – and you are more than creative! I’m stunned that you should want to read one of my books. I only have two on Amazon at the moment – the first two parts of a trilogy. So it makes sense to read Book 1 first. It’s called ‘Shadow of the Raven’ (Sons of Kings Book One). The trilogy is historical fiction, about King Alfred and the Danes (Vikings). Book 1 is an adventure tale. I’m writing Book 3 at the moment (i.e. when I’m not rabbiting on my blog!). Thank you so much for wanting to read my book. I could give you a link, but all you need to do is type the title into Amazon (books). I have been wanting to read your books for a while as I love your genre and your personal background. Yay! Now I have my beach reading for next week. I love hearing about your life in the UK! I’m such an Anglophile ☺️ I’m pretty sure I won’t hate your book! Thank you for that! I’ll be doing posts about Welsh castles and Edward I when I get back from Wales. My books are set in the 9th century, so you’ll find the names strange at first. A lot begin with ‘Aethel’ – pronounced ‘Ethel’ – which is just a prefix that means ‘noble’. I can’t change historical names, so I’m stuck with them, I’m afraid. It gets easier after Chapter One.